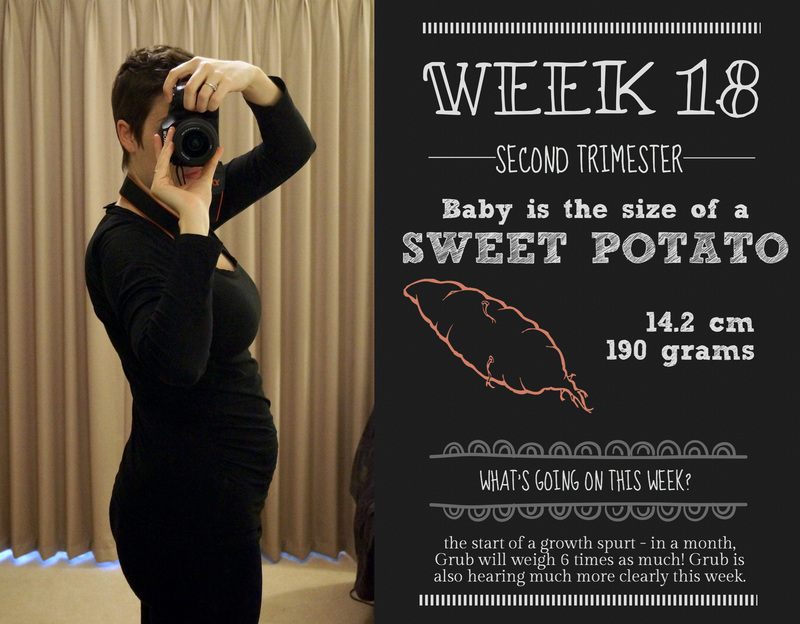 Baby: yet another not particularly good looking vegetable – a sweet potato. At least it has “sweet” in its name! What I’m cooking: A little eavesdropper! Grub can hear much better this week, and his/her immune system is developing. Get back, germs! Main symptom: a serious case of the can’t-be-fuckeds. I just can’t find any motivation to do anything this week. I think with winter in full swing, my body has decided that hibernation is my best bet. I agree, body, but my job doesn’t. So on we trudge. What’s on this week: The last week of work before a 2 week break, which I am hanging for (see above). I’ve also increased my yoga uptake this week, using the iPad. Bloody hell are my arms/legs/all other muscles known to man sore! I’m a bit whingy this week. Can you tell? Usually I try to give the upbeat rundown of the usual suspects above, but this week I just can’t find the energy to give even the tiniest of fucks (that just autocorrected to “ducks”, which is much cuter). I am almost literally dragging myself through the days, and with the winter solstice just passed, it doesn’t help that I’m leaving the house in the dark, and returning in the dark. Every fibre of my being is telling me to sleeeeeeeep, which could be a sign of another onset of a Grub growth spurt, or it could just be my winter slothiness. No way to tell. On the upside, I’m very, very close to a two week break, and a short visit to see some family should be a great way to start the unwinding. These two weeks coming have a lot more going on than the past few – I have another massage (excitement already building! ), our 20 week scan, and another hospital visit, this time with an obstetrician. Fingers crossed all looks good. In terms of symptoms this week, the big one has been nose bleeds. I’ve read that you can get more of these due to the increase in blood vessels, which causes the ones in your nostrils to swell (yum…), but until now it’s only been a bit of red colour if I blew my nose. This week, I’ve had a bloody nose all week, with a proper blood nose on Friday. It seems to have cleared up for now, but I’m keeping an eye on it. Not a big fan of bleeding anywhere, but the nose is just annoying. My fatigue levels have been in the extreme this week, but again I’m putting that down to just being exceedingly busy at work, and dragging myself to this break. Poor Mr Nester has been doing pretty much everything this week, with me collapsed on the couch, bleating apologetically. I’m hoping the break gives me an energy boost, otherwise the next 4 months are going to be tough!